To realize live geoinformation, which is about providing information as soon as it is available, new approaches for instant geoprocessing and efficient resource utilization are required. Currently, such geoprocessing on the web is handled sequentially instead. This article describes a new approach by processing geodata streams and thereby enabling a continuous processing for improved resource utilization rates. In particular, this work applies HTTP Live Streaming for example of standardized geoprocessing services. The approach is evaluated for processing a large volume datasets of OpenStreetMap data. The presented implementation is based on Free and Open Source software. The presented work has been supported by Raphael Rupprecht from the Institute for Geoinformatics. We acknowledge the various comments from Bastian Schäffer and input from the Geoprocessing Community of 52°North Open Source initiative. Finally, we are thankful for the valuable comments of the anonymous reviewers. Baranski, B. (2008). Grid Computing Enabled Web Processing Service. In E. Pebesma, M. Bishr, & T. Bartoschek (Eds. 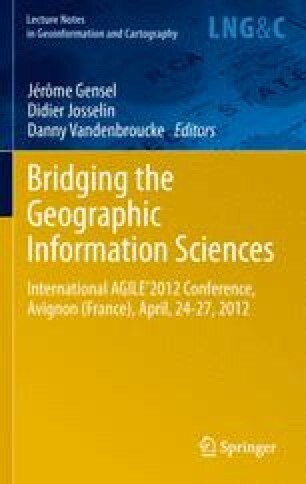 ), Proceedings of the 6th Geographic Information Days, IfGI prints (Vol. 32, pp. 243-256). Presented at the GI-days 2008, Muenster, Germany: Institute for Geoinformatics. Retrieved from http://www.gi-tage.de/archive/2008/downloads/acceptedPapers/Papers/Baranski.pdf. Haklay, M. (Muki), & Weber, P. (2008). OpenStreetMap: User-Generated Street Maps. IEEE Pervasive Computing, 7(4), 12-18. doi: 10.1109/MPRV.2008.80. Lanig, S., Schilling, A., Stollberg, B., & Zipf, A. (2008). Towards Standards-based Processing of Digital Elevation Models for Grid Computing through Web Processing Service (WPS). ICCSA, Lecture Notes in Computer Science (Vol. 5073, pp. 191-203). Presented at the Computational Science and Its Applications - ICCSA 2008, Perugia, Italy: Springer Verlag. doi:http://dx.doi.org/10.1007/978-3-540-69848-7_17. OGC. (2007). OpenGIS Web Processing Service (OGC implementation specification No. OGC 05-007r7). Open Geospatial Consortium. Retrieved from http://www.opengeospatial.org/standards/wps.